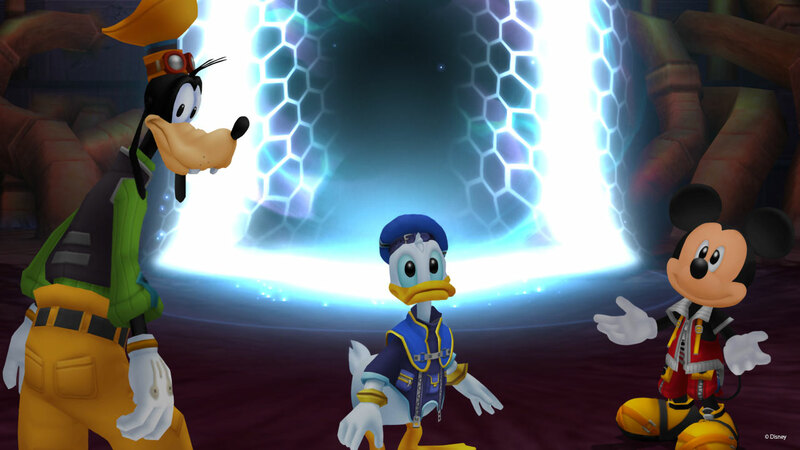 Kingdom Hearts HD 2.5 Remix continues the HD remastering of Kingdom Hearts titles. This time featuring Kingdom Hearts Birth By Sleep, Kingdom Hearts II, and Kingdom Hearts Re:coded. Kingdom Hearts Birth By Sleep was originally on the PlayStation Portable released in 2010, Kingdom Hearts II on the PlayStation 2 in 2006 and Kingdom Hearts Recoded in 2011 on the Nintendo DS. Just like with Kingdom Hearts HD 1.5 Remix, Kingdom Hearts HD 2.5 Remix will feature the Final Mix versions of Kingdom Hearts Birth By Sleep and Kingdom Hearts II by giving fans outside of Japan a chance to try out the new features and bosses that await them. Like it’s predecessor, the visual improvement into high definition are really beautiful. The character models look very smooth as does the backgrounds objects that surround each world. While majority of the models have improvements, other minor objects may seem to have been neglected and are noticeable with it looking a bit “fuzzy”, the same type of problem that existed with Kingdom Hearts HD 1.5 Remix. Kingdom Hearts Birth By Sleep is set ten years before the events of the first Kingdom Hearts game and introduces new protagonists Terra, Aqua, and Ventus as they train to become Keyblade Masters. When the Unversed, creatures that react to negative emotions appear in other worlds, the trio embark on a journey to defeat them all the while being deceived by Master Xehanort who tests their friendship and loyalties to their Master by setting his own plans into motion. They would explore worlds that were lost to the darkness in the first Kingdom Hearts, giving us a look at a few of the Disney Princesses and the peril that befalls them. While the worlds are presented very well and look amazing in high definition, one of the problems that the game suffered was the worlds appeared to be empty. While it was the limitations on the Playstation Portable, it feels awkward to see the same treatment done on a more powerful console. The game introduces the command deck system where you can synthesize commands and build a deck that fits your fighting style and each attack or magic has it’s own cooldown timer allowing you to use it again once it resets. Summons have been replaced with D-Link’s enabling you to summon another character’s command deck to aid you in battle. The camera has been mapped to the right analog allowing easier control of the camera and cycle of the command deck can be used with the L2/R2 buttons in addition to the directional pad. A drawback of the battle system is the load time that occurs when entering a Command Style. In the original game, you can install the data to the memory stick offering faster load times, in the HD Remix, there is no such option and you’ll have to sit and wait a moment for the Command Style to load interrupting the flow of battle. 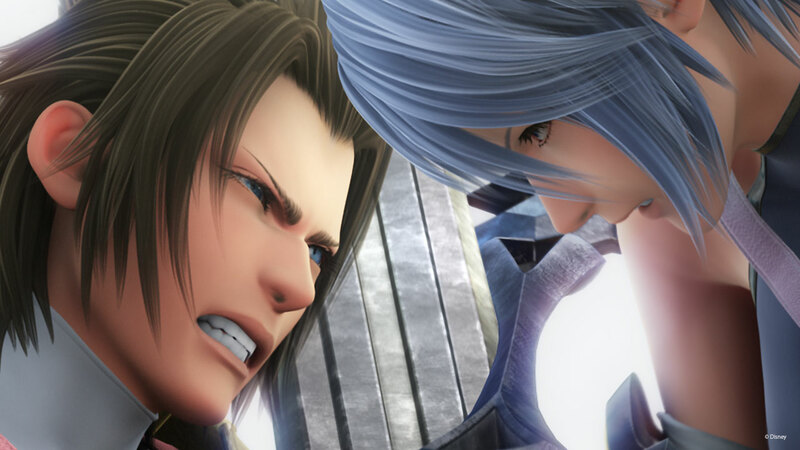 Fans can finally enjoy the Final Mix version of Birth By Sleep which includes a new Command Style, abilities, command boards, new bosses of the Mirage Arena and a new extended ending. One of the biggest changes of the Mirage Arena, is the removal of the online mode that was found in the Playstation Portable version. The reason behind this was to spend more time developing Kingdom Hearts III than to spend time on bringing over online multiplayer. The battles have been scaled down to match the single player style. Overall, Birth By Sleep’s transition to the Playstation 3 is huge. The updated models and worlds just take your breath away and featuring one the best battle systems the series have seen, it’ll be a favorite amongst fans. Kingdom Hearts II is the sequel to Kingdom Hearts and Kingdom Hearts Chain of Memories taking place after the events of Kingdom Hearts Chain of Memories and Kingdom Hearts 358/2 Days. The game continues the story of Sora, Donald and Goofy as they continue their quest to find Riku and King Mickey. Along the way, they fight off the Heartless and learn of a new threat known as Organization XIII and the Nobodies that threaten the worlds they would explore. 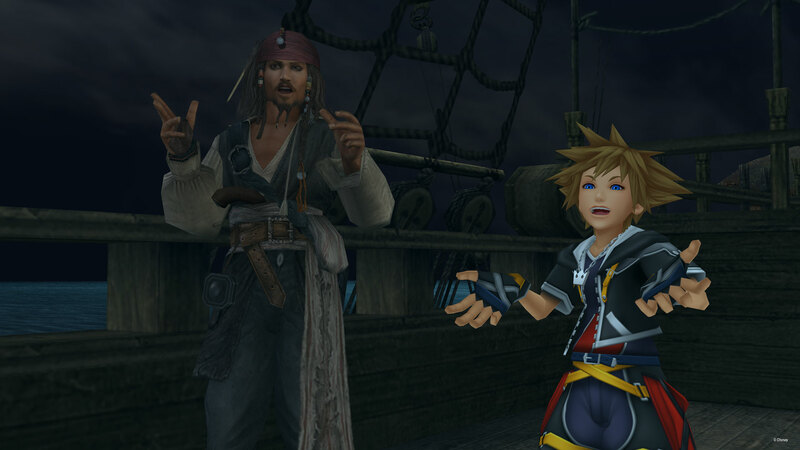 Sora returns to familiar worlds that tie into their respective movie sequels as well as dive into new worlds such as Port Royal, Pride Lands and Space Paranoids. Rather than continue with platform hopping and exploring areas from the first game, the approach in Kingdom Hearts II are more straightforward and linear. One of the biggest problems that haunt the Kingdom Hearts series are the lack of NPCs that would make the worlds so lively especially during cutscenes but majority of the time it just makes the worlds feel so empty. The game is a vast improvement over the original Kingdom Hearts in both gameplay and design. Sora can use more combos on the ground but more so in the air. New to Sora’s repertoire is Drive Form that allows him to use Donald or Goofy or both to enhance his speed, magic and regular attacks. The Final Mix version adds in a new Drive Form called Limit Form which gives Sora access to his attacks from the first Kingdom Hearts game. 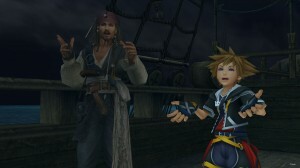 Co-op attacks make their debut allowing Sora to make powerful attacks with any of his party members. A drawback that’s similar to Birth By Sleep is the load times when entering Drive Forms during battle that delays the flow of the battle while enemies around Sora still move freely. Added in the Final Mix version is the Cavern of Remembrance which is a new dungeon that holds very powerful enemies on the way to the Garden of Assemblage which holds the Organization XIII data battles that can be fought as many times as you like. In addition, there are the new Mushroom XIII heartless mini games that each Mushroom requires a certain specific objective to be complete it in order to “satisfy” it. Lastly, a new boss that connects to Kingdom Hearts Birth By Sleep called the “Lingering Will” also makes an appearance and is considered a very tough battle even to veteran players. Kingdom Hearts II Final Mix also features re-orchestrated music done by The Video Game Orchestra to bring that rich feeling of music that Yoko Shimomura created. Hearing the music while playing the game can distract you as you want to listen to what the updated soundtracks sound like especially during the important boss fights. The music is just that good and makes playing through the game a lot more satisfying. Kingdom Hearts Re:coded begins after the events of Kingdom Hearts II with King Mickey, Jiminy Cricket, Donald, and Goofy as they investigate a mysterious message that was left behind in Jiminy’s Journal. Mickey digitizes the contents of the journal and relies on Data Sora to carry out the mission on revealing what the mysterious message refers to. Just like Kingdom Hearts 358/2 Days in Kingdom Hearts HD 1.5 Remix, Kingdom Hearts Re:coded features a cinematic experience that can be watched from beginning to end. It has a run time of about three hours including two new scenes made specifically for Re:coded and can be watched after watching all cutscenes. The most noticeable improvement Re:coded has over 358/2 Days is that they included battle scenes during cutscenes including boss fights as Days would simply fade to black before the battle would begin. Although the fights are very brief, it doesn’t interrupt the flow of the story and still brings it’s point across. They even keep true to how the fights are done in some of the Disney worlds from the game. Also added to Re:coded are the narrative scenes voiced by King Mickey with a static images in the background, finally giving life to the silent text scenes that made 358/2 Days feel boring. It shows that the development team listened to the complaints that fans showed with 358/2 Days and although it’s not perfect, it’s certainly a good improvement. Kingdom Hearts HD 2.5 Remix is almost perfect, giving players two of the favorite titles from the series and an improved cinematic experience makes this worth picking up. The Final Mix additions will keep players coming back for more by giving them challenges and extra bosses to deal with. Although there are minor gripes, this HD collection is a must have for those new to the series or those simply coming back to it. Disclaimer: This review was based off the English version of Kingdom Hearts HD 2.5 Remix for the Playstation 3 provided for free by Square Enix.